If you’re looking for another crowd-pleasing side to add to your holiday table, look no further. We made this recipe last year for Thanksgiving with my sister-in-law’s family. 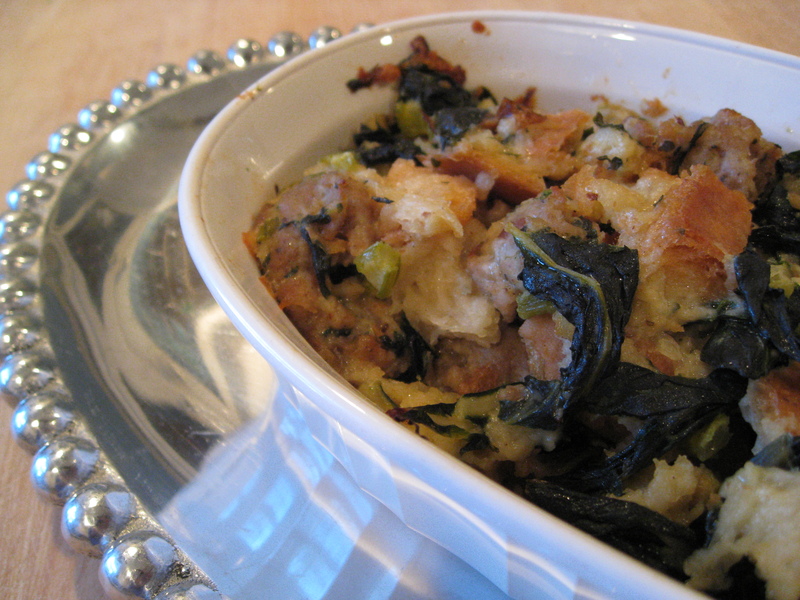 The addition of italian sausage, swiss chard and herbs brings a ton of great flavor to an otherwise very bready dish. What I love most about this recipe though, was how her family bakes this dish — instead of just cooking in the cavity of a turkey or in a large casserole dish, her family puts stuffing in muffin tins — hence stuffin’ muffins!. Everyone always loves the crispy pieces from the corners of traditionally prepared stuffing, so to make sure everyone gets some crispy bites the stuffing is divided into muffin pans, also providing for the perfect individual serving sizes — how brilliant is that! Serves 16 | Prep Time: 30-45 mins. | Cook Time: 30 mins. Cut bread into 1/2-in slices. Place slices in a large bowl and add milk. Mix gently with a wooden spoon to saturate with milk and let stand about 30 mins. Stir occasionally. Meanwhile, place a 6-8 QT. pot over high heat. Squeeze the sausages from casings into pot. Discard casings. Cook meat, stirring often to crumble, until lightly browned 10-15 mins; discard fat. Add parsley, garlic, onion and celery. Cook, stirring often, until vegetables are lightly browned 5-8 mins. Add chard and 1/2 cup water and cook, stirring often, until chard is wilted, about 5 mins. With your hands, squeeze bread slices to break them into tiny pieces. Add cooked meat mixture, parmesan, basil, sage and rosemary. Season mixture with salt to taste. Preheat oven to 350°. Spoon stuffing into a non-stick or well-greased muffin tins. Bake until hot or lightly browned, at least 30 mins. Make ahead: Up to 1 day ahead, make stuffing, put in casserole or muffin tins, cover and chill. Allow about 1 hour to bake. loaded with flavor and lots of crispy edges….everyone should try these.